We paid a few visits to Sizzling Skillet when it first opened for lunch & dinner but we weren’t too impressed, so we didn’t think of going back. Ever (harsh, but true). 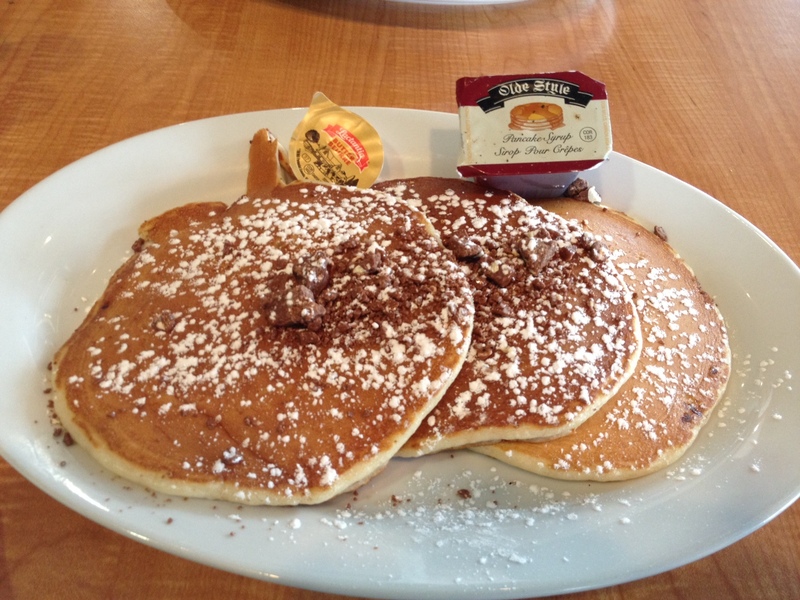 However, when we recently learned about their Toblerone pancakes, we reluctantly decided to give their breakfast a try. We are big suckers for good breakfast. 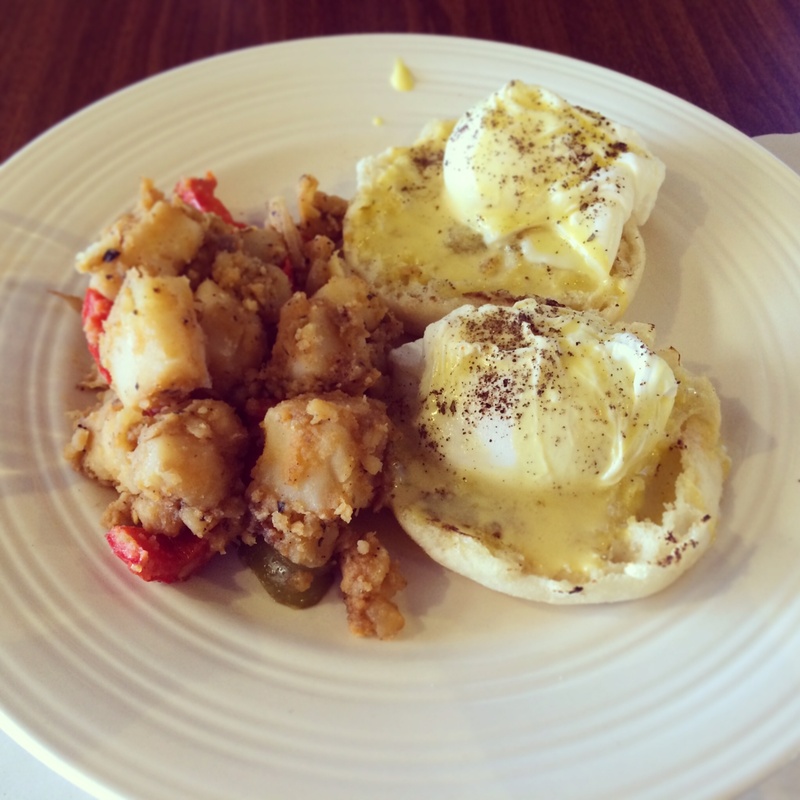 So one lazy Saturday morning, we said hey, let’s go give Sizzling Skillet a try today. The one incentive we had of trying this place again was their customer service. We have always appreciated their friendly and attentive service. We thought to ourselves, it’s ok if the breakfast turns out to be not so great….at least the customer service will rock! We were in for a surprise. The breakfast was amazing! Yes! It’s true. We ordered Toblerone Pancakes ($6.25) and Western Omelette ($7.95). The pancakes were soft and fluffy and had Toblerone shredded on top. We enjoyed these with lots of maple syrup (om nom nom anyone?). 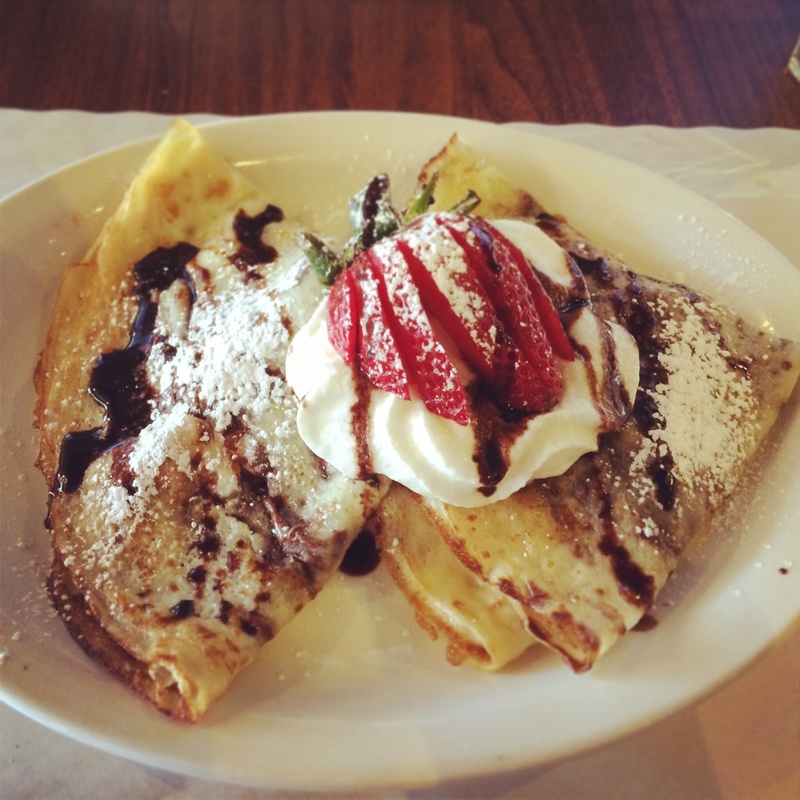 We usually think pancakes are kind of boring but these made us change our mind. These were truly awesome! We also ordered the Western Omelette, which came with rye bread and hash browns. This omelette had bell peppers, onions, salami and cheese. 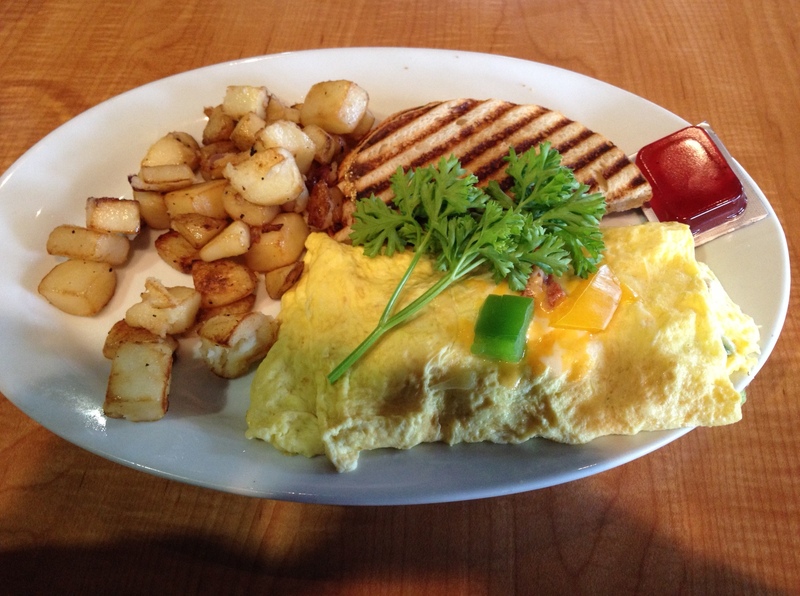 We gotta admit, salami was the reason we ordered this particular omelette. It did not disappoint. The omelette was delicious, the veggies were sautéed to perfection, the salami was as a good as it sounded and the cheese…well, you can’t go wrong with cheese. The hash browns were okay-ish but the rye bread was great. One bite and we were surprised at how good it tasted! Our bill came up to $16 and change which was pretty reasonable for two people in our opinion. We loved the breakfast so much that we decided to back the very next weekend and again ordered Toblerone Pancakes as well as Steak & Cheese Omelette Panini ($7.98). If you look at the menu you won’t find the Steak & Cheese Omelette Panini. It is because it was an item that the chef had us try as it is something he is thinking of introducing. 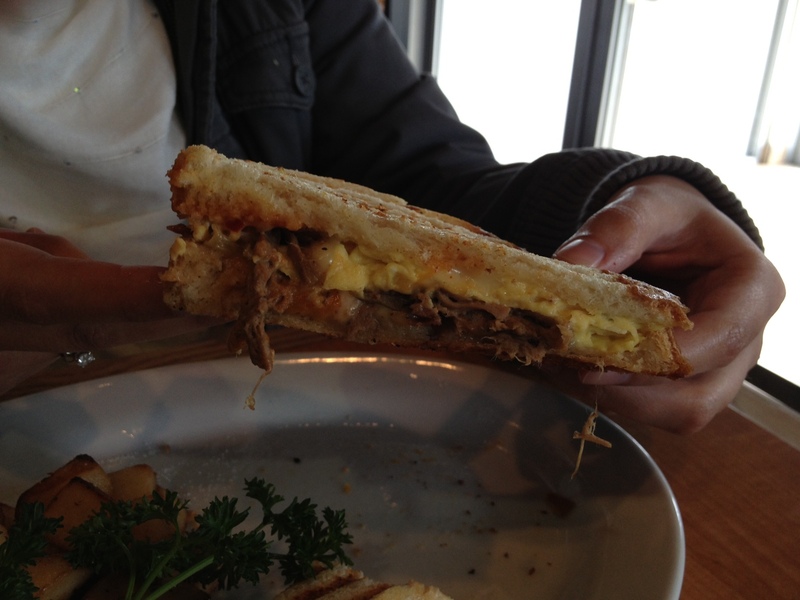 Hands down, this panini was the best thing we ever ate for breakfast. Tender steak, oozing cheese, and hot sauce between two slices of rye bread. One word: UH-MA-ZING! This was so good that we didn’t want to share it with each other. We highly recommend this item. 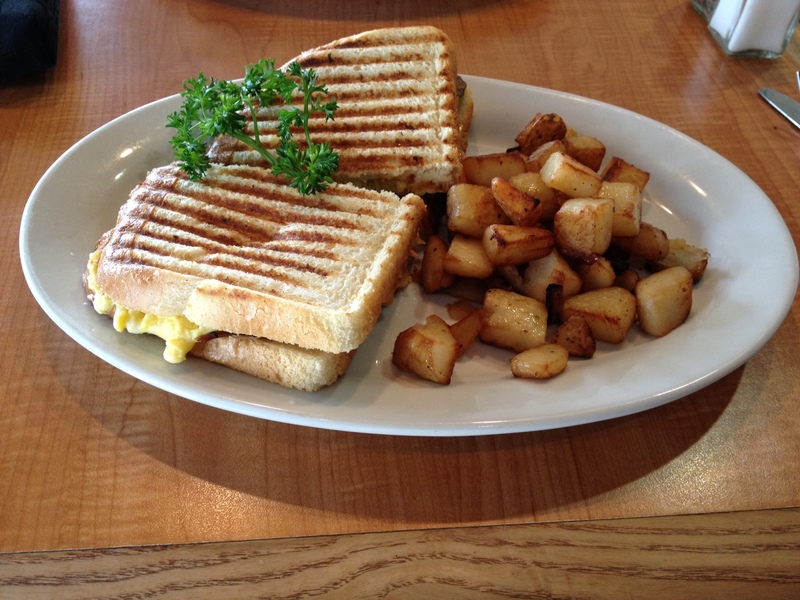 Just ask the chef to make your Steak & Cheese Omelette into a panini and you will be able to enjoy this delicious breakfast. So if you’re in Scarborough and in the mood for breakfast (with halal meat option), make sure you visit Sizzling Skillet. Their customer service remains very good! Please note: We were under the impression that breakfast is only on weekends. A recent phone call confirmed that it is also available during weekdays from 10am-3pm. Categories: Restaurant Reviews | Tags: breakfast, Eggs, Good halal food, GTA, Halal, halal breakfast toronto, Halal Food, Halal food toronto, Halal Meat, Halal Restaurant, Halal Salami, Omelette, Pancake, Scarborough, Sizzling Skillet, Toronto | Permalink.